The Essential Screenwriting Workshop, FAST Screenwriting Workshop, FAST, the FAST System, Writing FAST, the First Draft Genre Workshop, the First Draft Comedy Workshop, the Focus Workshop series, and the ScriptCOACH, are trademarks of Embryo Films. This site and all contents are copyright © 2002 - 2006 by Embryo Films. No part or whole of this website may be reproduced without express written permission. Webmasters may link to pages on this website for information purposes only, and without any inference that any relationship exists, unless otherwise agreed. Screenplays submitted to the Screenplay Development Centre, or to Embryo Films for an SDC service, are strictly confidential and always remain the property of the writer. 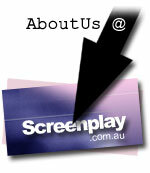 Embryo Films nor SDC makes any claim on any item submitted for assessment, editing, mentorship or consideration. Writers participating in the Screenplay Factory agree to be bound by the terms of that development initiative, which may differ from terms set forth herein. If you really want more legal mumbo jumbo, let us know, and we'll try to get some guys in suits to provide you what you need.